Schwinn 270 Recumbent Bike Review - Eat. Move. Hack. The Schwinn 270 Recumbent Bike is a technologically advanced exercise bike that comes with an array of features. Exercise bicycles are great for people who want to work out from home doing low-impact activities. Since riding an exercise bike isn’t all that different from a standard bicycle, only you get to avoid riding on outdoor trails and roads in inclement weather, this Schwinn recumbent bike is an excellent option. Read on to find out our thoughts on this piece of exercise machinery. A recumbent bike is one that places the rider in a comfortable position. With a standard exercise bike, the rider sits over the top, practically in a standing position. They are very upright. This is similar to the set up on a regular outdoor bicycle. A recumbent bike is quite different. The rider is reclined, and the pedals are located to the front of the machine. The seat is also larger and more comfortable, compared to that on a standard exercise bike. The overall setup is more comfortable, and it’s a lot safer for the rider. You won’t have to worry about injuring yourself should one of your feet slip from the pedals. If you have back issues, then a recumbent bike is what you need. It provides more support and much more natural sitting position. The Schwinn 270 is one of these bikes. The Schwinn 270 Recumbent Bike has a comfortable, contoured seat that comes with a backrest designed for lumbar support. The seat is also ventilated, which allows air to flow through during your workout. You can adjust the distance between the seat and the pedals, thanks to the aluminum frame and seat rail system. The seat moves both back and forth and even goes up slightly, in order to accommodate people of different heights. It operates with the turn of a lever and then locks into position. You won’t have to worry about the seat sliding back on you while you’re exercising. Each of the handgrips, which are located on either side of the seat, are ergonomically placed. They contain heart rate sensors, allowing you to gauge your progress and overall fitness level as you ride. This bike weighs a mere 93 pounds. That really isn’t much when you think about its overall size of (66.5 inches long, 12.5 inches wide, and 27.5 inches high.) The bike sits on four rubberized feet – two attached to the back bar and two on the front. If you want additional floor protection, there’s an optional exercise bike equipment mat available. This will prevent any scratches, should the bike move around mid-ride. It shouldn’t, but it never hurts to be careful. This Schwinn exercise bike is extremely high-tech. It comes with Bluetooth connectivity, which you can use to unite it with a number of fitness tracking devices, such as the Fitbit or Apple phone. You can also track your progress using an app, such as the included Schwinn Trainer App. This app is an ideal fitness tracker that you can download on your smartphone. With it, you can track how far you ride and judge your overall fitness. If you’re competing against other people to see who can ride the most miles each day, then this is ideal. On top of this, it’s easy to set a goal and meet it, thanks to this option. You won’t have to worry about keeping a written log of your mileage and overall progress. The RideSocial app, which also comes with the bike, is designed to make good use of the included DualTrack LCD display. You can race alongside other Schwinn 270 owners from all over the world. The app has a number of location settings, allowing to imagine you’re biking along dirt paths, around the edges of a lake, or on mountain paths. Although you won’t actually be outside, it doesn’t hurt to pretend. This feature makes exercising a little more fun since the scenery will distract you from the fact that you’re exercising. It always helps to (virtually) spread your wings a bit, even if you’re comfortably seated in your own home. This recumbent bike comes with a whopping 29 different programs to choose from. They are broken down into categories. One is quick start program, designed to kick off your new fitness program. Two are fitness tests, so you can see exactly where you’re at and come up with a plan for improvement. There are also 12 profile programs, four custom programs that you can set into place yourself, and nine heart rate control ones for people who need to be careful with their workouts. The overall amount of fitness that you can achieve with this bike is unparalleled. Also, the Schwinn 270 comes with a number of extra features. It has an amazing 25 different resistance levels. This means that there’s something for advanced riders, as well as beginners. No matter your level of fitness or experience, it’s customizable to your needs. This bike also has a high inertia drive system and a weighted flywheel. It also has a set of speakers, a USB charging port (great for smartphones and tablets), and even a media rack. If you prefer to read or watch television while you ride, you can do it with this bike. It even comes with a fan to help cool you off during those sweat-inducing workouts. Overall, the Schwinn 270 Recumbent Bike is a powerful exercise machine. Thanks to the 25 different resistance settings, 29 exercise programs, and the additional RideSocial and Schwinn Trainer Apps, you’ll end up in good shape in no time. The comfortable seat and ergonomic handgrips, not to mention the built-in fan, all make your workout experience enjoyable. 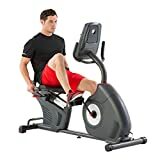 Whether you have back problems, need low impact exercise equipment, or just prefer to do your biking inside of your home (and out of the way of traffic) this is the machine for you.